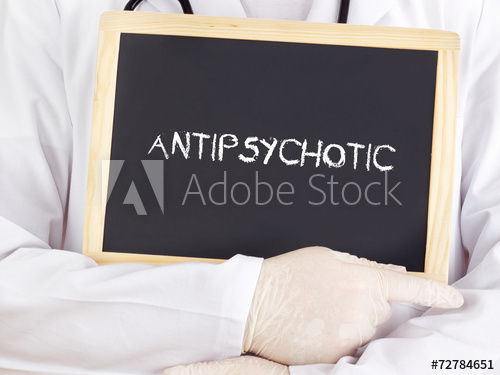 Antipsychotics are a class of drugs used primarily to treat psychotic disorders such as schizophrenia, mania due to bipolar disorder and severe depression. Now in order to gain better understanding of mechanism of action of antipsychotic drugs first we need to discuss the role of dopamine in the development of psychosis so the monoamine neurotransmitter dopamine plays a key role in the so called dopamine hypothesis which argues that the unusual behavior and experiences associated with psychosis can be largely explained by changes in dopamine function in the brain now dopamine has four major pathways by which it affects the brain number one the mesolimbic pathway which is thought to be hyperactive in schizophrenia and to mediate positive symptoms of psychosis such as delusions and hallucinations. Older first generation agents known as typicals and the newer second-generation agents known as atypicals the first generation typical antipsychotics all share the same main therapeutic goal that is to block d2 receptors furthermore typical antipsychotics are not selected for any of the four dopamine pathways and thus will block d2 receptors in almost all areas of the brain this has positive as well as negative consequences so blockade of dopamine receptors in the mesolimbic pathway reduces positive symptoms such as delusions and hallucinations which is beneficial however blockade of dopamine receptors in them as a cortical pathway that is already under active in schizophrenia may cause worsening of negative symptoms and does lead to diminished energy lack of motivation restrictions in emotional and verbal expressiveness and social disengagement furthermore blockage of dopamine receptors in the negros traído pathway may lead to extrapyramidal disorders tardive dyskinesia and parkinson’s-like symptoms such as tremors muscle rigidity and difficulty in starting and stopping movements lastly blockade of dopamine receptors in the tubero infundibular pathway may cause increasing blood prolactin levels which then may lead to Galacta RIA gynecomastia and sexual dysfunction now based on their affinity for d2 receptors typical antipsychotics are often sub classified as high potency or low potency the examples of high potency antipsychotics are haloperidol flu phenazine prochlorperazine and tri flow pairs in the example of low potency antipsychotic is chlorpromazine so generally speaking the high potency agents produce stronger antipsychotic effect at relatively low doses however they also tend to cause more extrapyramidal side effects and greater increase in prolactin levels on the other hand the less selective low potency agents do not bind to d2 receptor as tightly as the high potency agents and generally affect a range of other receptors including alpha adrenergic cholinergic and histamine receptors this can result in a variety of side effects. 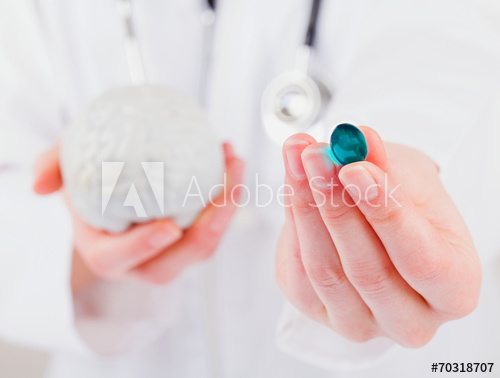 For example blockage of alpha adrenergic receptors can lead to orthostatic hypotension blockade of muscarinic receptors can lead to anticholinergic symptoms such as dry mouth blurred vision difficulty urinating and constipation and block it up h1 histamine receptors can lead to sedation and some weight gain now let’s move on to the second generation atypical antipsychotics in contrast to typical antipsychotics that primarily block only d2 receptors atypical agents appear to block both d2 receptors as well as serotonin receptors subtype 2a because serotonin inhibits dopamine release agents that block serotonin receptors may increase dopamine levels in brain areas that need it furthermore a typical occupied d2 receptors transiently and dissociate quickly allowing for relatively normal dopamine neurotransmission this modest d2 receptor blockade in combination with serotonin receptor blocking is thought to significantly lower the incidence of extrapyramidal side effects as well as decrease negative symptoms and improve cognition compared to typical agents the examples of atypical antipsychotics are re-proposal clozapine Loris adone olanzapine quetiapine risperidone and ziprasidone now in addition to dopamine and serotonin 2a receptor blocker atypical. Antipsychotics also bind to many other targets including other subtypes of certain receptors as was histamine alpha adrenergic and muscarinic receptors as a result the side-effects of second-generation agents can vary depending on the drugs receptor binding profile so for example atypical antipsychotics that have strong affinity for certain receptors subtype to see such as clozapine and olanzapine may cause metabolic side effects including weight gain hyperglycemia and dyslipidemia agents that have strong affinity for h1 receptors such as clozapine on Lanza beam and quetiapine may cause sedation and make also contribute to weight gain agents that have significant affinity for alpha one adrenergic receptors such as clozapine and risperidone may cause orthostatic hypotension in addition to that out of all second-generation agents risperidone seems to have the strongest affinity for d2 receptors and because of that it has the highest potential to induce extrapyramidal side effects and hyperprolactinemia lastly clozapine is the only antipsychotic that can cause serious condition called a granule cytosis that occurs when the bone marrow does not produce enough white blood cells called granule sites because this condition can be fatal periodic blood cell counts must be performed to ensure patient safety and with that I wanted to thank you for watching I hope you enjoyed this Lecture and as always stay tuned for more.